The price of victory is high, but so are the rewards. No team understands this more than the Hahnville boy’s basketball team.On Friday night, this determined group of young men advanced to the Top 28. They defeated the Wildcats of East St. John in overtime with a score of 71-69, making school history. Early Monday morning at 5:30a.m, before sunrise, the Hahnville tigers were off to a place high school players dream to go- the Top 28 in Lafayette at the Cajun Dome. Hahnville was scheduled to play that night at 8 p.m., against Woodlawn. With practice scheduled for 10 a.m. that morning, the day was well planned, the players were pumped with parents and fans not far behind. These district champs did all the right things to play in their first ever Top 28. 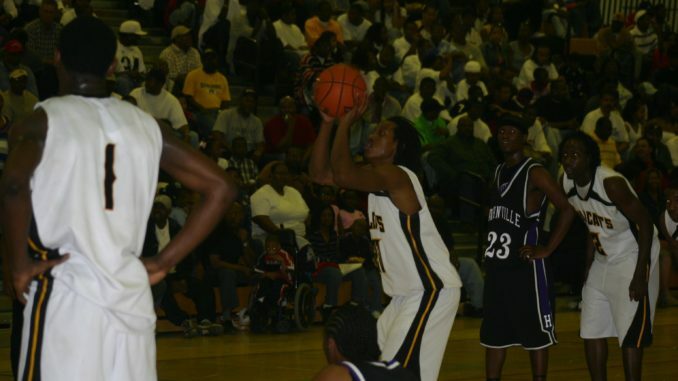 However, time wasn’t on their side as the Tigers fell to Woodlawn 58-49, late in the fourth quarter. In both games the Tigers played great defense, having to pick up their pace after minutes into the game. Yet, in their game against East St. John, Brian Singleton with the assistance of his teammates, played an extraordinary game leading all scorers with 32 points. East St. John was up for the challenge. Keith Cameron, Geonhndre Dorsey and Vincent Stewart scored in double figures. Trenton Marshall led the team with 17 points. While Hahnville stayed on top for most of the first half, two free throws by East St. John’s Jamaad Kenner would tie the game 28-28. Of course, Hahnville would do what it does best. They played hard, played smart, and played together. In the third quarter, they took charge and closed out the 3rd quarter leading by seven points. Again, it was Brain Singleton again whose free throws placed the Tigers on top with a 57-55 lead with 13 seconds left in the final quarter. East St. John’s, Trenton Marshal, fighting back, drew a foul with four seconds left in the game. His two free throws tied the game. As the game goes into over time, Tigers Lockett and Singleton put points on the board. These shots would eliminate East St. John’s chance of advancing. With the clock ticking, the loud buzzer sounded and the Tigers were on their way to the Top 28 in Lafayette. In the game against Woodlawn both Singleton and Lumar traded points back and forth points that got their game going. It took Hahnville minutes before putting points on the board in the first quarter. The Tigers seemed to start off slow but managed to lead going into the half with a score of 30-23. The Panthers kicked up their game a notch in the second half, gaining great momentum. In the second half, The Panthers outscored the Tigers 18-5 in the third quarter. Hahnville failed to make simple lay-ups which caused a noticeable frustration on the court. Woodlawn went on a scoring spree improving their field goal percentage from 43 in the first half to 62 percent in the second half. Panther’s Howard Austin and Gerrell Wells hit several three-pointers moving their team to a win. Hahnville seemed to run out of time. While their hard work got them to the Top 28, something they can hold their head up about, time wasn’t on their side as minutes ticked away on the clock and took away their dream of advancing to the finals.